After introducing considerable improvements to their SDK last month, Estimote has announced Stickers – extensions for regular beacons to add context to everyday objects. Estimote Stickers are complementary to Estimote Beacons. Whereas beacons add a layer of contextual intelligence to static locations such as stores, museums and airports, stickers extend that context to the objects within those venues. Stickers contain accelerometer and temperature sensors and an optimized ARM processor with flash memory and Bluetooth Smart controller, all inside a significantly smaller and thinner form factor. Stickers are truly designed to be placed on everyday objects. Simply attach a sticker to an item to turn it into a nearable - a smart, connected object that broadcasts data about its location, motion and temperature. The video created by Estimote shows the potential of Stickers when applied, literally, to objects we interact with on a daily basis. It's hard not to be impressed by the pace of rollouts by Estimote and, generally speaking, the entirely new dimension that beacons are opening up for third-party developers and apps. I was sent this article by Jeff Gamet about finding a lost Fitbit using your iPhone by my friend Stephen, and, while I don't use a Fitbit, I thought it'd be interesting to try the recommended app for my Jawbone UP24. Jeff used BTLExplorer, a free app, to measure the signal strength of the Fitbit tracker and find it using his iPhone, but I didn't like the outdated UI shown in the screenshot, so I went looking for similar apps on the App Store. As it turns out, there are a lot of free apps to find BLE devices on the App Store. I ended up installing three of them, but I'm fairly certain you'd be fine with just one. Bluetooth Smart Scanner shows device names, RSSI, and it can play sounds as it scans for nearby Bluetooth devices. It's got a pretty basic iOS 7 design, it gets the job done, and I like the sound option. LightBlue is similar to Bluetooth Smart Scanner, but it has a nicer interface with signal bars and lighter typography. It doesn't have sounds. BLE Discovery shows the same stats, but it comes with the ability to display a real-time graph for RSSI dBm and a three-second rolling average. You can tell it's working by walking around a device you're tracking and seeing the lines rise to “Strong signal” as you get closer. This quick experiment taught me that there's an abundance of BLE trackers on the App Store and that Jeff's method works. To test the apps, I asked my girlfriend to hide my Jawbone UP24 while I was in the kitchen; when I walked into our bedroom, I started looking at numbers on the screen, which kept getting higher as I got closer to our dog. She had hidden the UP24 under a cushion the dog was sleeping on; he wasn't pleased about my request to get up because I needed my fitness tracker back. Our embedded and systems engineers have worked for thousands of hours optimizing every packet in the Bluetooth stack and have devised several new schemes to extend the life of an Estimote Beacon measurably. We abstract 100% of this from developers and expose this neatly in both our mobile app and SDK for you to manage. And this is simply the first release in a series of power management features due out from us. We believe that pretty soon a beacon will be able to last forever, powering millions of interactions as consumers move about their journey through the physical world, and we want to be the first company to get there. The more I read about them, the more I believe beacons and contextual awareness will profoundly change the way we interact with apps, letting our devices have a better understanding of our location, intention, and interaction with our surroundings. We're already seeing this in retail, museums, stadiums, and even personal home automation. Estimote is leading the way with their iBeacon implementation, and you can check out the app here. 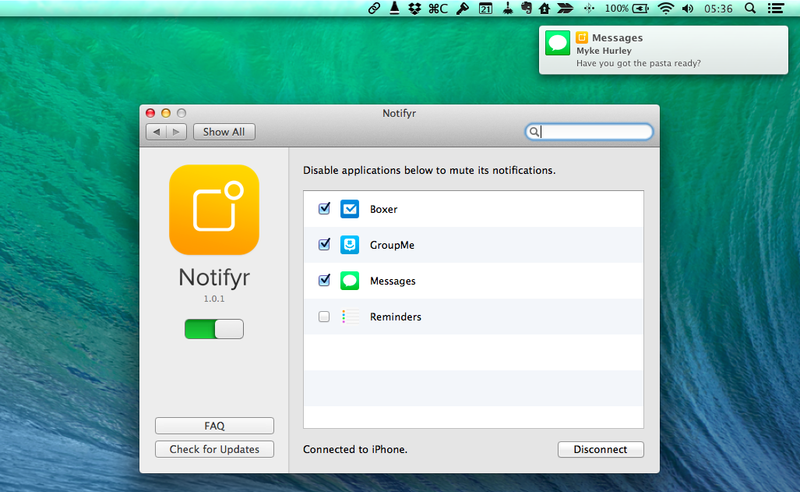 Developed by Joost van Dijk, Notifyr is a handy utility that lets you receive iOS notifications on your Mac using Bluetooth Low Energy. I've been trying the app with my iPhone 5s and mid-2011 MacBook Air since yesterday, and it does indeed work as advertised, mirroring notification banners from any iOS app on my Mac. Travel Radar is a new iPhone app that lets you track your luggage using iBeacons. By measuring approximate distance from the beacon to your iPhone, Travel Radar can fire off a notification when your luggage is nearby, allowing you to easily identify it and pick it up. The app can track up to two pieces of luggage within 20 meters, and it's $1.99 on the App Store. iBeacons seem perfect for this kind of short-range smart tracking, which has gotten better with iOS 7.1. The developers of Travel Radar have detailed a few options for consumer beacons in a blog post – they recommend the Estimote Beacons, which I've also been considering to tinker at home with a few ideas I have (see this). After opening an iBeacon app we hard closed it: not just putting it into the background tray but swiping it closed entirely. The phone still detected beacons and sent a message through the lock screen, something which in the past was reserved for apps that were at minimum running in the background tray. The functionality even works if you reboot your device: after you power down your phone and start it up again, it will continue listening for beacons even if you don’t open up the app again. As Doug notes, this is an important change for how iBeacon works with iOS apps – it sounds like it's now more stable and it should always work, removing the need to make sure an app is running. For retailers, museums, and any other place with iBeacon support, this means that launching an app the first time should be enough to have it always ready to listen for beacons in the future (unless the app gets uninstalled of course). And because the technology is based on Bluetooth LE, the impact on battery life should be minimal to non-existent. This seems like a great change for iBeacon. Guests arriving at the Aloft Hotel in Manhattan or one in Silicon Valley will soon be able to do something hotels have dreamed about offering for years: walk past the check-in desk and enter their rooms by using a smartphone as a room key. Guests at these properties will receive a message on a Starwood app containing a virtual key, which will unlock the door with a tap or twist of their phone through the use of Bluetooth technology. The company says the iPhone 4s or newer models and the Android phones running 4.3 or newer will be compatible. Personally, I still enjoy the interaction with staff members when I check in, which is also the reason why I always go talk to an employee when I need to buy something at my local Apple store (I tried Apple's EasyPay feature, and it felt odd). This is where the future is going, though, and there are several elements worth considering. Bluetooth LE has stolen the spotlight from NFC for low-power, peer-to-peer wireless transfers, and there are obvious security concerns over solutions like this, as well as home products like the Lockitron. It's an exciting time to watch pocket computers reshape our world. 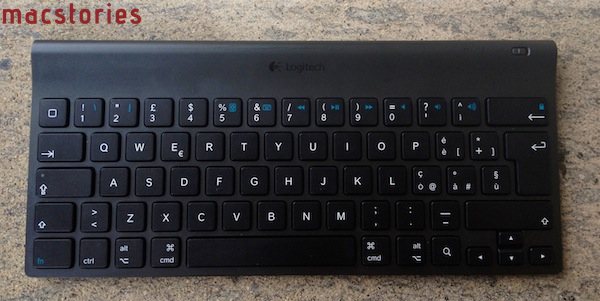 As I mentioned in my post about new apps and tools for 2012, I've been playing around with a Logitech Tablet Keyboard for iPad, which is available at $69 through Logitech's website or $59 on Amazon. The Tablet Keyboard connects to the iPad (or any iOS device) wirelessly over Bluetooth, comes with built-in batteries, a carrying case that can be turned into a stand for the iPad, and media keys that trigger some of the tablet's functions such as audio controls and Spotlight. Here are my impressions so far. As you can see, the keyboard isn't necessarily "standard" as it's been designed to include iOS-specific keys like shortcuts for Spotlight search, Home button, volume controls, slideshows, media playback and screen lock/unlock controls. 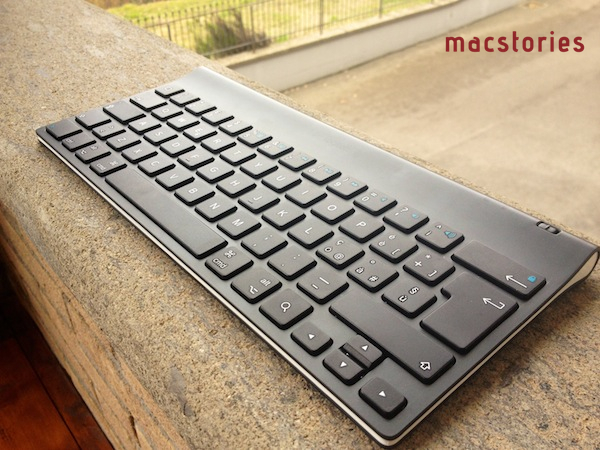 The basic layout is the one of a Mac keyboard, and the function keys can be activated by holding fn. Obviously, this isn't as intuitive as simply reaching out to the screen with your finger to adjust volume, but if you're going to work with your iPad using the keyboard, you'll want to know it's possible to do more than just type.